Do you find walking difficult or painful? Our feet enable us to do so many things yet we often take them for granted. Would you like to feel light on you feet and able to move freely? Walking is part of our every day life. It is more than the act of going from A to B , it is also a reflection of our state of mind. Walking can be a joy but for some it is a dread and feels like a burden, a chore because of the pain or discomfort it causes, not just in the feet but in many other areas of the body, knees, hips, back and even the neck. Our feet are the base for good balance and when used correctly for walking, a powerful tools for self healing. (It is easy to tell if you are walking well, by looking at the soles of you shoes and see if they wear evenly) Having happy feet can make you feel happy too! 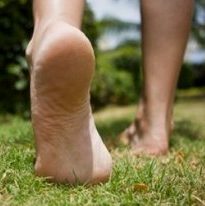 Simple movements and techniques you can use everyday to help you re-discover the joy of walking. We will explore and connect with our feet, discover what insights they can offer us and how our thought affect our movements and our experience of it. Find out the connection your feet have with you and and the world around you as well as the connection you have with them. The session will be playful and within your comfort zone. If you didn’t love your feet before, you may do afterwards. Booking: Essential to avoid disappointment as places are limited. You will be able to see how you are walking and what you are doing that is contributing to your discomfort and begin to correct this. Practice some ways to relax your feet, how to ease aching sore feet, including massaging your feet (even if you can’t reach them), make them more comfortable so that walking becomes easier and a pleasure. Discover how you can improve your balance. Explore how your thinking affects your balance and walking. At the end of this workshop you will see how your walking has changed and feel how to walk with more ease and comfort. Save £100’s on cost of learning this in a private sessions. Be warned, this could change your life! If you are not ready to change then this workshop is not for you.